Rockwell Hardness testers are available for room temperature microhardness testing on the ‘B’ and ‘C’ scales with the use of a 1/16” diameter ball for the former and a BRALE diamond indenter for the latter. A variety of calibration blocks and load scales are available for utilization with the other scales (e.g. 15-N, 30-N, etc.). Hot microhardness testing with either Vickers or Knoop indenters is possible on a NIKON QM Hot Microhardness Testing machine. 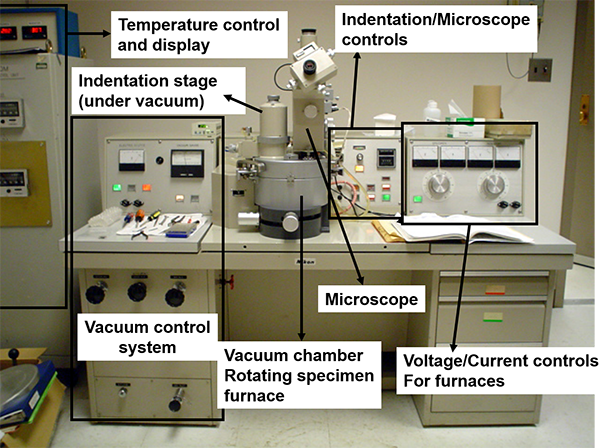 Samples can be tested in high vacuum or under inert gas with indentation loads ranging from 100 grams up to 1 kg at temperatures up to 1200 C. Vickers diamond indenters are useful up to 800 C while sapphire indenters are appropriate at higher temperatures, particularly if reaction between the sample and diamond indenter is possible.